At first glance the famous scree slopes on the south side of Wastwater look like they are just composed of loose rock which stretch approximately 2,000 feet, from top to base. The base being about 200 feet below the surface of the lake. The boulders were formed by ice and weathering erosion which has broken up the face of the rock and they lie on top of the lavas (mainly andesites), tuffs and agglomerates aka 'Borrowdale Volcanics' formed in catastrophic eruptions about 450 million years ago. The fissures have grown into gullies and are now home to trees which have taken root and at this time of year they are a vibrant green which really stands out against the dark forbidding rock and hidden crevasses. In May the sun rises over the back of Illgill Head casting strong sunlight on Wast Water quite early on. However, the slopes of the screes are so steep that they remain in shadow for much of the morning and it is only the tops of the trees that see any sunshine. Once I had taken a couple of standard photographs of 'The View' I was drawn to the detail on the screes. 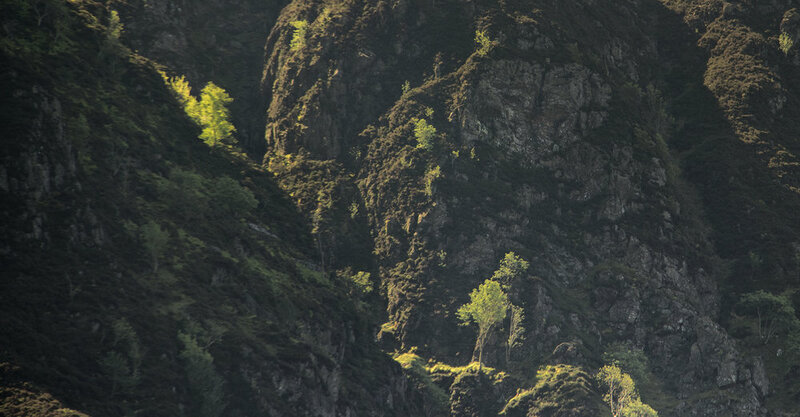 I took a series of photographs of the gulllies, trees and rock faces which are quite abstract in nature but which together provide a powerful impression of the magnitude of the screes. It is only by looking closely at the screes that you realise that they are not featureless but have a fascination and personality of their own.